Every now and then a memorial for someone who has died appears on the pavement. Usually there is a very good reason why the memorial has been written at that time on that particular spot on the ground. Teenager Alex Wildman died in July 2008, his suicide and the inquest that followed attracting much media attention because of allegations of bullying at his high school near Lismore in northern NSW. 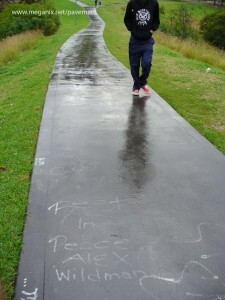 Epitaphs for Alex appeared in ‘unofficial’ media, such as videos on YouTube and graffiti on footpaths. The graffiti was written around the Campbelltown area in south-western Sydney by Alex’s friends at Ingleburn High School, where he had been a pupil until his family moved to Lismore. The painted RIP in the photograph appeared some months after much smaller messages for Alex were written in black texta along the edges of the same footpath on the western side of Macarthur Railway Station. I have written about memorialization of the dead on the pavement in City of Epitaphs, an article recently published in the on-line journal Culture Unbound. Hicks, M. 2009. City of epitaphs. Culture Unbound 1 (Article 26):453-467. 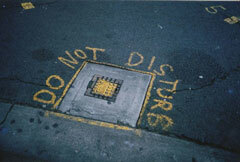 If you are like me, and enjoy discovering obituaries and other unexpected messages on the pavement, then I wish you a pleasurably doleful New Year. To my regular readers and to those just passing by – many thanks for your interest, your comments, your emails, your tip-offs and your photos. Best wishes for the year ahead and may you continue to enjoy finding surprises on the pavement. 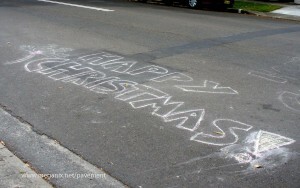 To-day’s photograph was taken this time last year in Belmont Road, Mosman, NSW.